Since 1997, Corporate Realty has shared a monthly mailer that not only highlights our recent transactions, but a recipe or story from a great local restaurant. In the past, we’ve featured recipes from Commander’s Palace, Galatoire’s, Leah Chase, and many others – and we’re proud to be associated with some of the best Louisiana has to offer. 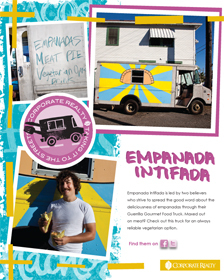 Keep checking our website for more tasty recipes from local mobile food vendors.